Lynch syndrome dramatically increases the risk for cancer in a person’s lifetime. The genetic condition can have a significant impact on individuals and families—resulting in early onset cancer, multiple cancers, and many generations of a family affected by cancer. As such, it is important to diagnose and manage Lynch syndrome in order to prevent cancer or detect it early when it is most treatable. Lynch syndrome has a variety of implications for individuals and families. Individuals who have Lynch syndrome have a much higher risk of developing colorectal, uterine, and other cancers than the general population. Furthermore, individuals with Lynch syndrome who already have cancer have a higher risk of developing new cancers in the future. What’s more—because Lynch syndrome is an inherited condition, it can affect other family members. A diagnosis of Lynch syndrome can shine the light on potentially increased risk throughout a family. The Amsterdam II criteria is simply a starting point for developing suspicion of Lynch syndrome, but it is an imperfect tool for making a clear diagnosis. Some families meet the Amsterdam II criteria, but do not have Lynch syndrome; other families do not meet the criteria, but do have Lynch syndrome. -Colorectal cancer diagnosed in two or more first-degree or second-degree relatives with Lynch-associated tumors, regardless of age. There is a process to diagnosing Lynch syndrome and it typically begins with a comprehensive review of the family medical history, which is sometimes followed by genetic testing. Family History: A genetic counselor will construct a multi-generational family tree and perform a comprehensive review of a family medical history in order to assess a family’s risk of Lynch syndrome. If the family history indicates the possibility of Lynch syndrome, the counselor might suggest further tests. 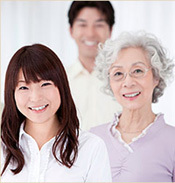 To find a genetic counselor in your area refer to our How to Find a Genetic Counselor page. Testing: There are two types of tests used for detecting Lynch syndrome—pathology tests and genetic blood tests. -Microsatellite instability (MSI) testing: Microsatellites are sequences of cellular DNA. In people with Lynch syndrome, tumors will show changes in the microsatellites and these changes are called microsatellite instability or MSI. Tumors with this instability are referred to as MSI-positive. Approximately 95 percent of colorectal and uterine cancers in Lynch syndrome patients are MSI-positive. -Immunohistochemistry (IHC) testing: Immunohistochemistry testing uses special dyes to stain tissue samples in order to determine whether the proteins made by the Lynch syndrome genes are present or absent. In patients with a Lynch syndrome gene mutation, the protein will be absent in the tumor. IHC testing can help identify which of the four Lynch syndrome genes to test for. The results of IHC or MSI tests can indicate that Lynch syndrome might be present, but they don’t provide definitive information because some people can develop these gene mutations only in their cancer cells. The suspicion of Lynch syndrome will be confirmed by blood tests. 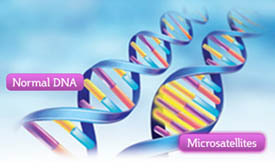 Genetic tests are tests that look for changes in your genes that indicate that you have Lynch syndrome. In order to undergo genetic testing, you will need to provide a blood sample. Genetic professionals will then perform a special laboratory analysis on your blood to look at specific gene mutations that cause Lynch syndrome.